COLUMBUS—State Representatives Dave Greenspan (R-Westlake) and Brigid Kelly (D-Cincinnati) today introduced legislation that will create a Sports Gaming Advisory Board, designed to legalize and regulate sports gaming in Ohio. The primary purpose of this legislation is in direct response to the U.S. Supreme Court’s decision to allow states the ability to offer legalized betting on professional and college sports. This bill allows the Ohio Lottery Commission to administer sports gaming in Ohio. Additionally, this bill will expand the Commission from nine to 11 members and require that no less than three of the 11 members have knowledge and experience in sports gaming. The Sports Gaming Advisory Board will research and develop recommendations with respect to sports gaming to the Commission. This board will consist of 11 members: seven appointed by the Governor, two by the Senate and two by the House. This board will end after three years. The Casino Control Commission shall play an integral operational role in sports wagering. The Casino Control Commission shall have the authority to regulate and investigate those engaging in sports wagering – at the direction of the Ohio Lottery Commission. This legislation also levies a tax on businesses that provide sports gaming. A 10 percent tax will be imposed on all sports gaming in this bill. Prior to the distribution of taxes to the Lottery Profits Education Fund, all applicable expenditures to operate the sports gaming shall be paid. Two percent of the taxes imposed shall be dedicated to the problem gaming and addiction fund. Furthermore, this bill will provide additional funding for public education in Ohio and increase resources for gaming and addiction services. The bill will now await its bill number and committee assignment. Representative Dave Greenspan is serving his second term in the Ohio House of Representatives. He represents the 16th Ohio House District, which includes the cities of Bay Village, Fairview Park, North Olmsted, Rocky River, and Westlake. For more information, contact Rep Greenspan’s office at (614) 466-0961 or Rep16@ohiohouse.gov. COLUMBUS-State Representative Dave Greenspan (Westlake) today announced that he has introduced House Bill 157, which will create a Local Government Adult and Senior Services Fund in the State Treasury. House Bill 157 authorizes the director of the office of Budget and Management (OBM) to allocate to the Senior Services Fund 50 percent of the annual surplus revenue remaining after required allocations to the Budget Stabilization Fund have been made. “One common and growing demand on our local communities is the services that we provide to our seniors. This funding approach will help provide needed resources for our seniors,” Representative Greenspan said. “Our seniors have been and continue to be productive members of our communities; this commitment will demonstrate our respect for their contributions as we assist them in meeting their needs,” Representative Greenspan added. Each county treasurer would receive an appropriation from the fund based on that county’s senior population as calculated by the OBM director and certified by the county auditor. None of that money could be used for any purpose other than support of adult protective services or senior services and facilities. Representative Dave Greenspan is currently serving his second term in the Ohio House of Representatives. For more information, contact Rep Greenspan's office at (614) 466-0961 or Rep16@ohiohouse.gov. COLUMBUS—State Representative Dave Greenspan (R-Westlake) was successful in including a 75 percent increase ($30 million) in funding for public transportation. Additionally, the House increased the public transportation funding by another $30 million to $100 million. The funds appropriated for public transportation are federal flex funds and not motor fuel tax, the use of which are prohibited under the Ohio Constitution. COLUMBUS—State Representative Dave Greenspan (R-Westlake) recently introduced House Bill 47, legislation that will increase the time within which property tax complaints must be decided and to change the name of the Ohio Legal Assistance Foundation. This legislation will allow county boards of revisions, especially those in heavily populated counties, additional time to be compliant. House Bill 47 was assigned to the committee on Ways and Means and will now await its first hearing. COLUMBUS-State Representative Dave Greenspan (R-Westlake) recently introduced House Bill 50, legislation that will declare inventions at county hospitals to be hospital property. This piece of legislation allows county hospitals the same protections of their intellectual property that state institutions of higher education and their affiliated medical centers currently have. “I am humbled to introduce this piece of legislation in an effort to create a level playing field amongst medical centers and charter county hospitals,” Greenspan said. House Bill 50 was assigned to the committee on Civil Justice and has had one hearing. COLUMBUS-State Representative Dave Greenspan (R-Westlake) today announced his re- introduction of House Bill 46. This legislation requires the Ohio Treasurer of State to create and maintain the Ohio State Government Expenditure Database, improving government transparency and accessibility for Ohioans. "Making government more accessible and transparent for Ohioans and my constituents was a goal of mine when I first started on Cuyahoga County Council," Greenspan said. "I am excited to be re-introducing this measure." House Bill 46 was assigned to the committee on State and Local Government and will now await its first hearing. Speaker of the House Larry Householder (R-Glenford) made the committee appointments this past Friday for the 133rd General Assembly of the Ohio House of Representatives. Representative Dave Greenspan is serving his second term in the Ohio House of Representatives. He represents Ohio’s 16th House District, which includes the cities of Bay Village, Fairview Park, North Olmsted, Rocky River, and Westlake. COLUMBUS-State Representative Dave Greenspan (R-Westlake) was sworn in yesterday to a second term as a member of the Ohio House of Representatives for the 133rd General Assembly. He represents the 16th Ohio House District, which includes Bay Village, Fairview Park, North Olmsted, Rocky River, and Westlake. "I will use my experience, enthusiasm, and time to continue to bring responsible and responsive representation for our state," said Rep. Greenspan. "It will give me great satisfaction knowing that I made a difference for my constituents and community, and that I will always stand for what is right." As a member of the Ohio House of Representatives for the 132nd General Assembly, Representative Greenspan has sponsored 17 pieces of meaningful legislation including House Bill 38, The Public Safety and Military Protection Act, that was recently signed into law. He also secured over $800,000 for his district to enhance and improve various community projects. Representative Greenspan also served as Chair of the Finance Subcommittee on Transportation as well as a member of the Community & Family Advancement, Finance, Financial Institutions, Housing & Urban Development, Government Accountability & Oversight, and Transportation & Public Safety Committees. Representative Greenspan has a wealth of experience in local government, serving in different capacities across the country. He was on the Inaugural City Council for the city of Sandy Springs, Georgia and also served two terms as an Inaugural Councilman for Cuyahoga County. Representative Greenspan graduated from Troy University in Alabama with a bachelor's degree in Business Administration and Accounting. Currently, Representative Greenspan is a small business owner and Chief Executive Officer of Green Elk Consulting Services, a consulting company that focuses on emerging/start-up ventures and turn-around business entities. Representative Greenspan is married with three children and resides in Westlake. COLUMBUS—State Representative Dave Greenspan (R-Westlake) recently voted in support of legislation that would ease the graduation requirements for this year’s graduating class to match the requirements implemented for last year’s graduating class, addressing a concern brought forward by Ohio schools. House Bill 491 requires the State Board of Education to issue substitute licenses to speech-language pathologists, audiologists, registered nurses, physical therapists and other professionals. However, the bill was amended to clarify temporary alternative graduation pathways for 2019 and 2020 high school graduations. COLUMBUS—State Representative Dave Greenspan (R-Westlake) today announced passage of legislation requiring the Ohio Treasurer of State to create and maintain the Ohio State Government Expenditure Database, improving government transparency and accessibility for Ohioans. House Bill 40, jointly sponsored by Rep. Greenspan and Rep. Jonathan Dever (R-Madeira), essentially makes permanent the database that was created by current Ohio Treasurer Josh Mandel, ensuring future state treasurers will continue to offer Ohioans access to state expenditure information, free of charge. The bill requires that the database be open to the public and comprised of information about state entities’ expenditures, which would be reported by each entity at least monthly (regarding the preceding month) through the Ohio Administrative Knowledge System (OAKS). The database will include information such as state and school district employee salary and employment information, and will also supply graphs and charts summarizing the available data. The bill prohibits information that is confidential or not a public record from being included in the database. Having passed out of the House with bipartisan support, House Bill 40 now awaits consideration by the Ohio Senate. Westlake, OH November 1, 2018 -Dave Greenspan, candidate for re-election to the Ohio House of Representatives, 16th District is humbled and honored to accept the endorsement from the following Elected Officials. The 16th House District is comprised of the cities of Bay Village, Fairview Park, North Olmsted, Rocky River and Westlake. 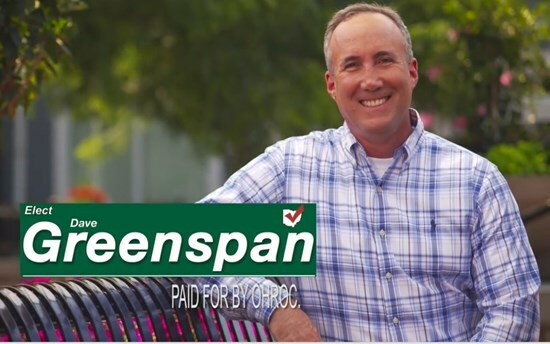 For more information on Dave Greenspan visit www.GreenspanForOhio.com. COLUMBUS-State Representative Dave Greenspan (R-Westlake) applauded the nearly $56 million in funding today approved by the Ohio Controlling Board to combat the opioid epidemic. The State Opioid Response (SOR) Grant, implemented by the Ohio Department of Mental Health and Addiction Services (MHAS) and awarded by the federal government, supplements the more than $180 million in new money appropriated through 2017's state operating budget, initiated by the Ohio House and supported by Greenspan, to aggressively respond to drug addiction in the state. Projections submitted to the board estimate that treatment and recovery support services would be provided to 9,000 addicted individuals, a total of 18,000 people over the span of the 2-year project. I want to be sure you are kept informed of the updates in Columbus. The legislative developments here are relevant to your lives, and I always strive to accurately represent you in the legislature. Please contact my office at (614) 466-0961 or Rep16@ohiohouse.gov if I can be of assistance to you. COLUMBUS—State Representative Dave Greenspan (R-Westlake) today encouraged participation in National Prescription Drug Take Back Day, which takes place Saturday, October 27, 2018 from 10 AM to 2 PM at collection sites across the country. This initiative, created by the Drug Enforcement Administration (DEA), offers citizens the opportunity to dispose of expired or unused medication in a safe, anonymous and convenient manner. The Ohio Department of Health (ODH) reported that in 2017, the number of prescription opioid-related deaths went down by seven percent from the previous year. Drug Take Back Day provides a way for Ohioans to continue that momentum and combat the opioid epidemic by disposing of medication that might otherwise be obtained and misused by a friend or family member. The most recent drug take back day, which took place in April of 2018, collected 40,509 lbs. of medication in Ohio at 288 collection sites. Law enforcement officers and pharmacy employees may be present at take-back locations to assist. Participating locations can be found at takebackday.dea.gov with the Collection Site Locator tool. COLUMBUS—State Representative Dave Greenspan (R-Westlake) today applauded Attorney General Mike DeWine for recently announcing the School Safety Training Grant Program as part of House Bill 318. As a result, schools in Cuyahoga County’s Ohio House District 16 will have the opportunity to receive nearly $90,000 in funding for safety efforts, including training for school resource officers, safety and security materials and mental health programs. As a whole, the amount that schools in Cuyahoga County have the opportunity to receive is over $800,000. The legislature’s investment into Ohio’s public schools, chartered nonpublic schools, and schools operated by county boards of developmental disabilities will be in the form of a non-competitive grant through the Attorney General’s office. Each school will receive a letter from Attorney General DeWine with instructions on how they can access these funds for the remainder of the fiscal year (October 1, 2018 through June 30, 2019). A full list of grant awards can be found on the Ohio Attorney General’s website and also attached to this press release. Thank you to all of the Associations and Organizations that have endorsed me for re-election to the Ohio House of Representatives. I am truly humbled by your continued support and trust that you have placed in me. I will continue to fight for Responsible & Responsive representation for our State each and every day. The Ohio Manufacturers' Association - Political Action Committee (OMA-PAC). "I would like to express my sincere gratitude to our campaign staff, fellow elected officials and their staff & our dozens of volunteers for their tireless efforts and dedication. Your continued support is both energizing and humbling. This would not be possible without all of you. Thank you very much and I look forward to continue to represent you in Columbus." Westlake, OH September 28, 2018 - Dave Greenspan, candidate for the Ohio House of Representatives, 16th District is humbled and honored to accept the endorsement from the Ohio State Chiropractic Association. "I want to thank Nicholas Strata, Executive Director of the Ohio State Chiropractic Association for their support and encouragement for our candidacy for re-election to the State House." Greenspan said. 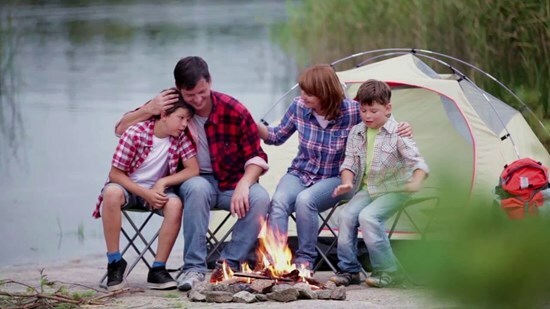 The transition from summer to fall is often a busy one, filled with back-to-school shopping and fresh routines. As this new season begins, I would like to look back and mention a few bills I have authored here in the Ohio House that I believe have significance to our everyday lives, and that are particularly meaningful to me. The work I do here in the House is an effort to improve life for you, my constituents, and for Ohioans all around the state. It is impossible to forget the tragic events that took place in Danville, when a member of the Danville Police Department was ambushed on the job. Not long before that, three Youngstown firefighters were targeted by a shooter. With these horrific instances on my mind, I authored House Bill 38, the “Public Safety and Military Protection Act.” While it is upsetting that such legislation is necessary, the bill will serve to ensure stiffer ramifications for those intending harm to the public servants who play vital roles in our communities. It expands state law by adding firefighters, EMS and military personnel to those professions for which there are heightened penalties for aggravated murder and felonious assault (if the offender had targeted intent). As I’m sure has been the case for all parents, I have been troubled by the violence and unrest plaguing our schools. Suicide is now the second-highest cause of death among American teenagers, and while that statistic is not specifically attributed to bullying, I firmly believe that our children’s mental health is affected by bullying witnessed and experienced at school. To reach out and implement better student protection, I sponsored House Bill 360, the “Anti-Bullying and Hazing Act.” This bill builds on suspension and expulsion policies and adds community service to offender reparations. The bill also emphasizes the importance of not only seeking to support victims, but helping bullies make better choices: schools can offer tutoring and counseling to both parties involved. Lastly, I would like to mention House Bill 415, legislation creating the Local Government Road Improvement Fund. With reliable roads serving as Ohioans’ gateway to everything from job opportunities to grocery stores, House Bill 415 provides local governments with an alternative source of funding for roadway improvements. Ohio will accomplish this by moving one-half of state surplus revenue to the new fund each fiscal year, beginning in 2020. Specific amounts will be based on locally maintained center lane miles per county. Westlake, Ohio: September 25, 2018 - Dave Greenspan, candidate for re-election to the Ohio House of Representatives, 16th District is pleased to announce that this past weekend we reached a milestone in the campaign! "I would like to express my sincere gratitude to our campaign staff, fellow elected officials and their staff & our dozens of volunteers for their tireless efforts and dedication. Your continued support is both energizing and humbling. This would not be possible without all of you. Thank you very much and I look forward to continue to represent you in Columbus." Greenspan stated. Westlake, OH September 18, 2018 - Dave Greenspan, candidate for re-election to the Ohio House of Representatives, 16th District is humbled and honored to accept the endorsement from the Teamsters Ohio D.R.I.V.E. "I want to thank the members and Patrick J. Darrow, President of Teamsters Ohio D.R.I.V.E. for their support and encouragement for our candidacy for re-election to the State House." Greenspan said. "I want to thank Pierre Bejjani, and the entire membership of C.A.M.E.O for their support and encouragement for our candidacy for re-election to the State House and for all of the support and encouragement they have given me over the years." Greenspan said. Westlake, OH August 29, 2018 - Dave Greenspan, candidate for re-election to the Ohio House of Representatives, 16th District is humbled and honored to accept the endorsement from The Ohio Manufacturers' Association - Political Action Committee (OMA-PAC). "Our goal is to help elect the most qualified candidates to protect and grow Ohio manufacturing," said OMA president Eric Burkland. "With today's endorsement, we've taken an important step in accomplishing that goal. Dave Greenspan supports the issues that are important to Ohio manufacturers and their employees and understands that a strong manufacturing sector leads to a healthier economy, good jobs and improved quality of life for all Ohioans. We are pleased to support Dave Greenspan." The Ohio Manufacturers' Association, a volunteer-driven organization of more than 1,400 large-, medium- and small-sized member companies that serves as the voice of manufacturers in the Ohio General Assembly and before state regulatory agencies. The OMA's mission is to protect and grow Ohio manufacturing. "I want to thank the 1,400 members companies and Ryan Augsburger, Vice President and Managing Director, of the The Ohio Manufacturers' Association - Political Action Committee (OMA-PAC) for their continued and encouragement for our candidacy for the State House." Greenspan said. Westlake, OH August 22, 2018 - Dave Greenspan, is humbled and honored to accept the endorsement from the Ohio Chamber of Commerce PAC for the November 6, 2018 General Election. "I want to thank the over 8,000 members and Rich Thompson, Director of Political Programs for the Ohio Chamber of Commerce PAC for their support and encouragement." Greenspan said. Westlake, OH August 17, 2018 - Dave Greenspan, candidate for re-election to the Ohio House of Representatives, 16th District is humbled and honored to accept the endorsement from the International Union of Operating Engineers Local 18. "I want to thank Richard Dalton, Business Manager, Thomas Byers, President and Mark Totman, Legislative Director and the members of Local 18 for their support and encouragement for our candidacy for re-election to the Ohio House of Representatives." Greenspan said. Westlake, OH August 14, 2018 - Dave Greenspan, candidate for re-election to the Ohio House of Representatives, 16th District is humbled and honored to accept the 2018 Friend of Agriculture Designation from the Ohio Farm Bureau Federation Agricultural for Good Government Political Action Committee (OFBF-AGGPAC). In a statement OFBF-AGGPAC stated, "On behalf of the Ohio Farm Bureau Federation Agricultural for Good Government Political Action Committee (AFBF-AGGPAC), we are pleased to inform you that you have received the "2018 Friends of Agriculture" designation for your strong support of Ohio agriculture." "I want to thank the Ohio Farm Bureau Federation, Frank Burkett, III, President and Adam Sharp, Executive Vice President for their support and encouragement for our candidacy for the State House." Greenspan said. COLUMBUS - Legislation sponsored by State Representatives Dave Greenspan (R-Westlake) and John Barnes (D-Cleveland), which helps decrease the high number of Ohioans with suspended driver’s licenses, was signed recently by Governor Kasich. House Bill 336 creates a short-term program intended to help indigent Ohioans who are unable to afford the reinstatement fee or fines that they have accrued throughout their license suspension. According to bill sponsors, many of these individuals continue to drive, risking further financial repercussion for either themselves or other drivers on the road. The “Reinstatement Fee Amnesty Initiative” establishes a temporary six-month debt reduction and waiver program for individuals who had their licenses suspended for a variety of reasons, with the exception of offenses involving alcohol, drugs or a deadly weapon. The program will set up certain eligibility requirements for a fee reduction or waiver, including the following: that the individual’s suspension has been in effect for at least 18 months, the individual is indigent, and the individual has completed all court-ordered sanctions other than paying the reinstatement fee. An indigent person, according to the bill, is an individual who participates in the supplemental nutrition assistance program (SNAP). Additionally, if a person has reinstatement fees for multiple offenses, they must pay either the lowest fee or 10 percent of the amount owed for all such offenses, whichever is greater. House Bill 336 seeks to help Ohioans who may not have the extra funds to pay the fees and are trying to get back on their feet. The bill would incentivize individuals to legally reinstate their license, keep their insurance coverage, and prevent them from continuing to drive on a suspended license. Westlake, OH August 7, 2018 - Dave Greenspan, candidate for re-election to the Ohio House of Representatives, 16th District is humbled and honored to accept the endorsement from ACT OHIO - Affiliated Construction Trades. "I want to thank Matt Szollosi, Executive Director of ACT OHIO - Affiliate Construction Trades and their over 92,000 highly skilled, highly trained women and men in the construction industry in Ohio for their support and encouragement for our candidacy for re-election to the Ohio House of Representatives." Greenspan said. Westlake, OH July 19, 2016 - Dave Greenspan, candidate for re-election to the Ohio House of Representatives, 16th District is humbled and honored to accept the endorsement from the Ohio State Medical Association PAC. "I would like to thank the over 16,000 physician, resident and student members, Marvin Rorick, MD, Chair OSMAPAC, & Monica Hueckel, Sr. Director of Government Relations, OSMA of the Ohio State Medical Association PAC for their support and encouragement for our candidacy for re-election to the State House." Greenspan said. Westlake, OH July 17, 2018, - Dave Greenspan, , member of the Ohio House of Representatives from the 16th District, is humbled and honored to accept the endorsement from the Fraternal Order of Police Lodge 25. "I wish to thank Edward Favre and the members of FOP Lodge 25 for their support and encouragement for our re-election to the State House." Greenspan said. COLUMBUS—State Representative Dave Greenspan (R-Westlake) honored three local law enforcement officers for their exemplary service with commendations on behalf of the Ohio House. Greenspan recognized Officer Bill Saringer with the North Olmsted Police Department, who received the 2017 Virgil McDaniel Award from the Western Cuyahoga Fraternal Order of Police Lodge 25. The award is given to an officer who has gone above and beyond the call of duty to provide exceptional service to the community. Rick Grane, the sergeant at arms of the Western Cuyahoga Fraternal Order of Police Association Lodge 28, was also honored for receiving the Fraternal Order of Police Auxiliary Officer of the Year. Additionally, Jim Carbone was recognized as the School Resource Officer of the Year. He serves at North Olmsted High School. Westlake, OH July 12, 2018- Dave Greenspan, candidate for re-election to the Ohio House of Representatives, 16th District has opened a campaign office. Campaign Manager George Phillips stated, "We are pleased to announce that Team Greenspan has opened a campaign office in the heart of the 16th District. This office will not only serve our staff and countless dedicated volunteers, but most importantly this will give the residents of the district a place and the opportunity to stop in, and talk with us regarding issues that are most important to them, their family and their community." COLUMBUS—The Ohio House of Representatives today passed legislation aimed at attracting more major sporting events to Ohio and, in turn, generating additional revenue for the state and local communities. House Bill 531 removes the current cap on the amount of sports event grants that may be awarded in a fiscal year for sporting events that are competitively bid on by other states. Grants are awarded by the Director of Development Services to counties, municipalities or local organizing committees to support the selection for national or international sports competitions. These sports include football, auto racing, boxing, horse racing, mixed martial arts or any sport governed by an international federation and included in the Olympics, Pan American Games or Commonwealth games. Some popular national events include the Men’s and Women’s NCAA Basketball Tournament and professional baseball or basketball all-star games. “This bill will make Ohio more competitive in attracting major sports events and promoting our travel and destination assets,” said Rep. Dave Greenspan (R-Westlake), who joint-sponsored the bill with Rep. Kirk Schuring (R-Canton). The legislation, which passed the House with bipartisan support, removes the current $500,000 per-event grant cap, as well as the $1 million cap on the number of events that can be awarded in a fiscal year. The bill requires the Director of Development Services to consult with the state’s tax commissioner to outline a formula projecting incremental sales tax increases expected to be generated by hosting the event. All grants would be paid from state sales tax receipts. Counties, municipalities and local organizing committees are eligible for grant funding only if the sales tax receipts generated by the event exceeds the benchmark set by the tax commissioner. That is, simply landing a major, competitively-bid sporting event does not guarantee that these entities will receive a grant. House Bill 531 also authorizes the release of grants for sports-related events other than competitions, such as the NFL Draft. Sporting events that have been held in Ohio within the previous two years are ineligible. Having passed the House, the bill now awaits consideration by the Ohio Senate. COLUMBUS-The Ohio House of Representatives today passed legislation that will make it easier for county boards of revision, especially those in heavily populated counties, more time to hear property tax complaints. Boards of revision consist of a panel of elected officials within a county to which property owners can bring complaints and concerns in regards to appraisals, sales data and other property assessment matters. Current state law requires boards of revision to decide on property complaints within 90 days of when they are filed. Oftentimes, particularly in the state's most populous counties, this is not enough time to keep up with the number of complaints that are brought forward. Therefore, House Bill 361, sponsored by Rep. Dave Greenspan (R-Westlake), extends the deadline for resolving a complaint to 180 days and delays the beginning of that period until the last day a complaint is filed. House Bill 361 now awaits consideration by the Ohio Senate. Westlake, OH May 21, 2018 Dave Greenspan, Member of Ohio House of Representatives from the 16th District, is humbled and honored to accept the endorsement from the United Brotherhood of Carpenters and Joiners of America, Carpenters Local Union Number 435. “I want to thank the members and Political Advisor, Dwayne Kee, of Local 435 for their support and encouragement for our candidacy for the State House.” Greenspan said. Westlake, OH April 24, 2018 - Dave Greenspan, member of Ohio House of Representatives from the 16th District, is humbled and honored to accept the endorsement from the Northern Ohio Firefighters Association. "I want to thank the members and Scott Maynor, President of Northern Ohio Firefighters Association for their support and encouragement of our candidacy for the State House." Greenspan said. Westlake, OH April 23, 2018 -Dave Greenspan, member of Ohio House of Representatives from the 16th District, is humbled and honored to accept the endorsement from the Cleveland Building and Construction Trades Council. "I wish to thank David J. Wondolowski, Executive Secretary, and the Council for their support and encouragement of our candidacy for the State House." Greenspan said. The Cleveland Building and Construction Trades Council represents more than 10,000 highly-skilled and highly-trained craftworkers and provides essential coordination, representation and support to the work of 31 affiliated unions and district councils. COLUMBUS—State Representative Dave Greenspan (R-Westlake) applauded the Senate’s passage of House Bill 251, which he introduced last year. The legislation expands the current five-year limit on political subdivisions investment ability to a limit of 10 years. This increases the maturity of the investment, which increases the municipality’s revenue opportunity. Ultimately, House Bill 251 allows a political subdivision to purchase the debt of another subdivision for a longer period of time. This would be advantageous for both the purchaser and seller because it would result in more investment income for the municipality purchasing the debt, and less interest accrued for the municipality selling their debt, saving taxpayer money. The current five-year limit hinders many subdivisions from investing in state and local bonds because the investment is impractical when restricted to such a short period of time, according to committee testimony. House Bill 251 passed the Senate unanimously and now goes to the Governor’s desk for his signature. Westlake, OH April 16, 2018 - Dave Greenspan, member of Ohio House of Representatives from the 16th District, is humbled and honored to accept the endorsement from The Ohio Society of CPA's. "I want to thank the over 22,000 members, Barbara Benton, Vice President, Government Relations and Gregory Saul, Esq., Director of Tax Policy of the Ohio Society of CPA's for their support and encouragement for our candidacy for the State House." Greenspan said. COLUMBUS—State Representative Dave Greenspan (R-Westlake) today announced that the Ohio House has approved legislation he sponsored that works to prevent school place bullying, also known as the Ohio Anti-Bullying and Hazing Act. House Bill 360 strengthens consequences for bullying in public schools. Under the bill, there are more parameters for in-school suspensions, and it gives school districts greater flexibility regarding investigations and how to best conduct them within the district or school. The bill applies to public school students in grades 4 through 12 only and exempts students with developmental disabilities. House Bill 360 now awaits consideration by the Ohio Senate. Westlake, OH April 11, 2018 -Dave Greenspan, member of Ohio House of Representatives from the 16th District, is humbled and honored to accept the endorsement from National Federation of Independent Business/Ohio. In a letter to Mr. Greenspan NFIB/Ohio said - "Your knowledge and sensitivity to business issues were key factors in our endorsement process. We believe you will be a positive and proactive voice on behalf of small businesses while in the Ohio Legislature." "I want to thank Roger Geiger, Vice President/Executive Director of National Federation of Independent Business/Ohio for the organizations support and encouragement for our candidacy for the State House." Greenspan said. Westlake, OH April 10, 2018 -Dave Greenspan, member of Ohio House of Representatives from the 16th District, is humbled and honored to accept the endorsement from The Ohio Manufacturers’ Association. "I want to thank Ryan Augsburger, Vice President & Managing Director of Public Policy Services for the organizations support and encouragement for our candidacy for the State House." Greenspan said. Westlake, OH April 3, 2018 - Dave Greenspan, member of Ohio House of Representatives from the 16th District is humbled and honored to accept the endorsement from the Laborers' International Union of North America, Local Number 310. "I want to thank the members and Terry Joyce, Business Manager of Local 310 for their support and encouragement for our candidacy for the State House." Greenspan said. Westlake, OH March 28, 2018 - Dave Greenspan, is humbled and honored to accept the endorsement from the Ohio Chamber of Commerce PAC for the May 8, 2018 Primary Election. "I want to thank the over 8,000 members and Rich Thompson, Director of Political Programs of the Ohio Chamber of Commerce PAC for their support and encouragement." Greenspan said. Westlake, OH March 21, 2018, - Dave Greenspan, , member of Ohio House of Representatives from the 16th District, is humbled and honored to accept the endorsement from the Sheet Metal Workers Local Union No. 24..
"I wish to thank Rodney French and the members of the Local 24 for their support and encouragement for our re-election to the State House." Greenspan said. COLUMBUS—State Representative Dave Greenspan (R-Westlake) announced that the Ohio House of Representatives Education and Career Readiness Committee has approved legislation he sponsored that works to prevent school place bullying. House Bill 360, also known as the Ohio Anti-Bullying and Hazing Act, strengthens consequences for bullying in public schools, a pervasive problem in today’s society. The bill preserves local control regarding bullying by providing complete autonomy for public schools to address and respond to the first reported offense of bullying towards a student. If bullying persists, then the provisions of the Ohio Anti-Bullying and Hazing Act shall be enacted. House Bill 360 now awaits referral to the floor to be heard by the full House. Westlake, OH March 14, 2018, - Dave Greenspan, , member of Ohio House of Representatives from the 16th District, is humbled and honored to accept the endorsement from the United Food & Commercial Workers, Local 880. "I wish to thank Carl Ivka, President and the members of Local 880 for their support and encouragement for our re-election to the State House." Greenspan said. The capital budget, House Bill 529, contains funding for needed improvements to public services and facilities across the state, including schools, roads and bridges, waterways and parks. The bill also increases investments in mental health and addiction services facilities. Rep. Greenspan worked with local government and community leaders in the Westshore community to understand and advocate for his district’s needs and priorities, and also advocated for projects outside his district that are beneficial to Cuyahoga County as a whole. Ensuring a commitment to Ohio’s students and preparing them for the workforce, the bill makes a statewide investment of $600 million in school construction, including repairs, renovations and maintenance, as well as $483 million for projects supporting Ohio’s public colleges and universities. The bill also features $514 million to repair roads, bridges, water-supply systems and storm sewers. This includes $100 million to support the Clean Ohio program, which funds the preservation of green space, farmland, open spaces and expanded recreational opportunities. The state continues to promote policies aimed at stemming the tide of addiction, and the capital budget works to help local communities in this effort. Nearly $222 million was invested for critical health and human services funding for youth services, developmental disabilities, mental health, addiction treatment and women’s health initiatives. House Bill 529 now heads to the Ohio Senate for further consideration. For more information, visit http://www.obm.ohio.gov/budget/capital/. Westlake, OH March 7, 2018, - Dave Greenspan, , member of Ohio House of Representatives from the 16th District, is humbled and honored to accept the endorsement from the Ohio-Kentucky Administrative District Council of Bricklayers & Allied Craftworkers. "I want to thank Kenneth Kudela, Executive Director and the members of Bricklayers & Allied Craftworkers for their support and encouragement for our re-election to the State House." Greenspan said. COLUMBUS—State Representative Dave Greenspan (R-Westlake) today announced that the Ohio Legislative Service Commission is accepting applications for its 13-month Legislative and Telecommunications Fellowship Program. The Commission will hire 24 fellows to work with members of the Ohio General Assembly during 2019. Legislative fellow duties include assisting members of the Ohio General Assembly with constituent work, writing press releases and speeches, assisting in legislative research, attending meetings, and performing administrative duties. Telecommunications fellows assist in televising House and Senate proceedings and in preparing educational video productions about the General Assembly and the legislative process. Fellows receive full state of Ohio employee benefits and are paid $31,200 per year, with the opportunity to earn a $2,000 bonus based on length of service in the program. Legislative fellowship application materials must be postmarked by April 1, 2018 to be considered for the program. The application deadline for the two telecommunications positions is April 30, 2018. All applicants must have graduated from a four-year college degree program by the December start date. Persons holding graduate or professional degrees may apply. The bill prevents any General Assembly from passing legislation that decreases the amount allocated to the Local Government Improvement Fund, which must be least 1.66 percent of the General Revenue Fund. Sub. H.B. 415 also includes certain limitations in order to keep the Budget Stabilization Fund (BSF), otherwise known as the state’s Rainy Day Fund, at a sufficient balance. Historically, surplus revenue from the General Revenue Fund has been deposited into the BSF. Beginning in fiscal year 2020, Sub. H.B. 415 provides that half of the surplus will be moved to the Local Government Road Improvement Fund, and the other fifty percent will be placed in the BSF to maintain its required level (which is 8.5 percent of the General Revenue Fund). The distribution of funds will be based on locally maintained center lane miles in each county. Sub. H.B. 415 is a Buckeye Pathway bill, strengthening communities and towns by providing monetary resources for road improvement throughout the state. Something as simple as a safe road can supply an opportunity for Ohio residents. Having passed out of the House, Substitute House Bill 415 now awaits consideration by the Ohio Senate. Westlake, OH February 28, 2018, -Dave Greenspan, member of Ohio House of Representatives from the 16th District, announced today the endorsement from the Sheet Metal Workers International Association, Local Union, No. 33. "I wish to thank Tim Miller and the members of the Local 33 for their support and encouragement for our re-election to the State House." Greenspan said. 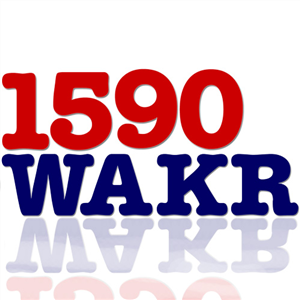 Westlake, OH February 21, 2018, -Dave Greenspan, member of Ohio House of Representatives from the 16th District, announced today the endorsement of the Cement Masons' Local Union Number 404 for his 2018 re-election campaign. "I want to thank the members of Local 404 and their Business Manager Charles Wanat for their support and encouragement for our re-election to the State House." Greenspan said. Westlake, OH February 19, 2018, -Dave Greenspan, member of Ohio House of Representatives from the 16th District, announced today the endorsement of the Republican Party of Cuyahoga County for his 2018 re-election campaign. "I am honored to have the endorsement of the Republican Party of Cuyahoga County. I wish to thank the members of the Executive and Central Committees for their support and encouragement towards our efforts to provide practical, responsible, responsive solutions for the 16th District and the State of Ohio. " Greenspan commented. 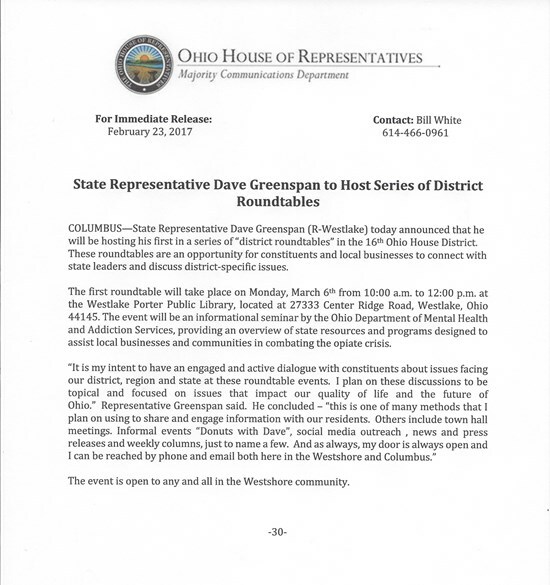 COLUMBUS-State Representative Dave Greenspan (R-Westlake) will be hosting a community forum on Thursday, March 8, 2018 at 7:00p.m. at the Fairview Park Branch of Cuyahoga County Public Library (21255 Lorain Rd, Cleveland, OH 44126). The meeting will begin by recognizing former elected officials from the district followed by a discussion regarding Rep. Greenspan’s legislation, House Bill 360, the Ohio Anti-Bulling and Anti-Hazing Act. Additionally, Rep. Greenspan has joint sponsored House Bill 481, a partner bill to House Bill 360, which will provide funding for anti-bullying programming, training and counseling support and services. Representative Greenspan encourages everyone to attend the forum and looks forward to an insightful discussion. For any questions, concerns or comments please contact Representative Greenspan’s office at (614) 466-0961 or at rep16@ohiohouse.gov. Westlake, OH February 9, 2018, – Dave Greenspan, member of Ohio House of Representatives from the 16th District, announced today the endorsement of the Ohio Republican Party for his 2018 re-election campaign. COLUMBUS-State Representative Dave Greenspan (R-Westlake) announced that the Ohio House has approved Senate Joint Resolution 5, paving the way for historic, bipartisan redistricting reform to now go before voters on the primary ballot on May 8th. SJR 5 ensures that Ohio's congressional map-making process features bipartisan support, keeps communities of interest whole and promotes districts that are compact and competitive. "I am proud to have been a part of the passing of SJR 5," said Greenspan. "The legislators of Ohio put aside our differences to come together and pass bipartisan congressional redistricting reform. I appreciate all of my constituents who took the time to contact my office regarding this important topic." The culmination of months of bipartisan talks among the House, Senate and engaged citizen groups, SJR 5 aims to implement a congressional redistricting system similar to Issue 1, a 2015 ballot initiative that changed the way state House and Senate districts are drawn. Ohioans approved that ballot initiative with over 70 percent of the vote. If passed by voters in May, Ohio's new redistricting system would require drawing a map that earns three-fifths support by each chamber of the General Assembly, including at least 50 percent support from the minority party. Failure to meet that threshold would send the decision to the seven-member Redistricting Commission, consisting of appointees from the Governor, Secretary of State and State Auditor, as well as two Republicans and two Democrats from the Ohio House and Senate. The commission's goal would be to create a 10-year map that earns majority approval from the commission and approval from at least two minority party members. Further steps are also in place should the commission fail to meet that requirement, including ultimately the General Assembly approving a temporary map lasting for four years, after which time the process begins anew to create a six-year map. Having passed both legislative chambers, SJR 5 now heads to the Secretary of State's office to be filed as a ballot initiative. International Coverage of HCR 10 which will condemn manifestations of anti-semitism. COLUMBUS—State Representative Dave Greenspan (R-Westlake) today announced that he has jointly introduced House Bill 481, legislation that creates the “Stop Bullying” license plate and Stop Bullying License Plate Fund. The license plate will cost 25 dollars to buy, with these funds being transferred to the Stop Bullying License Plate Fund. Interested parties and not-for-profits may also donate to the fund. All money contributed to the fund will be used to support bullying prevention and related educational programming. House Bill 481 will soon be referred to a House committee for further consideration. Ohio House Passes "Utility Worker Protection Act"
COLUMBUS—The Ohio House of Representatives passed legislation that provides added protections for utility workers while performing their jobs. House Bill 276, also known as the “Utility Worker Protection Act,” expands the offense of aggravated menacing to prohibit threatening a utility worker with a deadly weapon with the intent to obstruct the operation of a utility. The individual committing this offense would have to know or have reasonable cause to know that the victim is a utility worker. Violation of the law will generally result in a first degree misdemeanor, unless the offender previously was convicted of aggravated menacing, in which case it will be a fifth degree felony. “I am encouraged that the House of Representatives has supported this important piece of legislation that protects the men and women who work hard to ensure that our critical infrastructure needs such as electricity, communications, water, and other important infrastructure are protected,” Greenspan said. This legislation was brought to the attention of both Reps. Rezabek and Greenspan by multiple utility companies after they reported an increase in incidents where their workers were threatened while trying to perform their jobs. Having passed the House, HB 276 now awaits further consideration by the Ohio Senate. As we begin the New Year I would like to reflect back on my first year serving the people of the 16th District. I spent 2017 working diligently on various issues facing my district and all Ohioans. It was a very active year, filled with numerous learning opportunities and engaging issues. One of the most important and impactful experiences that I had was the privilege to work on the biennial state operating budget. I was fortunate to have the opportunity to lead on several budget amendments that not only assisted local communities in the area of public safety but also early childhood education. to mention a few. Additionally, I hosted 15 in-district events, five “Donuts with Dave” and ten roundtables focusing on specific topics such as the opioid epidemic, economic development and aging and long-term care. These events continue to provide me the opportunity to stay connected with my district and to hear from my constituents. Additionally, I introduced nearly a dozen pieces of legislation. House Bill 38, The Public Safety and Military Protection Act - passed the House unanimously and is waiting for approval from the Senate. House Bill 38 will increase the penalty for murder or assault of a first responder or military member. I have also introduced legislation that provides additional funding for our local communities and legislation that will address the bullying and hazing issues facing our state. Additionally, I sponsored a bill with Representative John Barnes (D-Cleveland) to require the registrar of motor vehicles to establish a six month driver's license reinstatement fee debt reduction and amnesty program. I am proud of the several pieces of legislation that I have introduced with both Republicans and Democrats and many of my bills have received overwhelming bipartisan support. I am proud of our accomplishments over the past year, and am continually honored to be your representative. I am immensely grateful for this experience and know I have the citizens of District 16 and Ohio to thank. I look forward to 2018 and all of the plans in place to better serve our communities. Westlake, OH January 11, 2018 - Dave Greenspan, member of Ohio House of Representatives from the 16th District, announced today the endorsements from current and former Westshore elected officials for his 2018 re-election campaign. Columbus - Speaker of the Ohio House Clifford A. Rosenberger (R-Clarksville) today appointed State Representative Dave Greenspan (R-Westlake) to serve on the House Finance Committee, where he will chair the Finance Subcommittee on Transportation. Rep. Greenspan is serving his first term in the Ohio House of Representatives and also currently serves on the Community and Family Advancement Committee, the Economic Development, Commerce and Labor Committee, the Government Accountability and Oversight Committee, and the Transportation and Public Safety Committee. He represents the 16th Ohio House District, which includes the cities of Bay Village, Fairview Park, North Olmsted, Rocky River, and Westlake. COLUMBUS - The Ohio House Wednesday approved House Bill 336, legislation sponsored by State Representatives Dave Greenspan (R-Westlake) and John Barnes (D-Cleveland), to help decrease the high number of Ohioans with suspended driver’s licenses. The short-term program is intended to help indigent Ohioans who are unable to afford the reinstatement fee or fines that they have accrued throughout their license suspension. According to bill sponsors, many of these individuals continue to drive, risking further financial repercussion for either themselves or other drivers on the road. “It is our goal to create a reasonable, practical, and measured attempt to make sure that Ohioans are legal to drive with a valid driver’s license and insurance while driving through our neighborhoods and on our interstates,” said Greenspan. The “Reinstatement Fee Amnesty Initiative” would establish a temporary six-month debt reduction and waiver program for individuals who had their licenses suspended for a variety of reasons, with the exception of offenses involving alcohol, drugs or a deadly weapon. The program would set up certain eligibility requirements for a fee reduction or waiver, including the following: that the individual’s suspension has been in effect for at least 18 months, the individual is indigent, and the individual has completed all court-ordered sanctions other than paying the reinstatement fee. House Bill 336 is a Buckeye Pathway bill that received bipartisan approval in today’s House floor vote. The legislation now awaits consideration by the Ohio Senate. Columbus -State Representatives Dave Greenspan (R-Westlake) today announced that the Ohio House has passed legislation creating standards for the use of credit and debit cards by political subdivisions, which he joint sponsored with Rep. Kirk Schuring (R-Canton). Current law in Ohio lacks a uniform policy across the state regarding the use of credit and debit cards by local government entities. House Bill 312 would require political subdivisions to follow certain procedures—including adopting a comprehensive policy, conducting a periodic review, and providing itemized receipts—for credit cards. “House Bill 312 provides transparent, accountable, and practical safeguards to protect the integrity of our local communities, and the responsible stewardship of taxpayer dollars is paramount to building and sustaining the public’s trust,” said Greenspan. The bill requires the name of the political subdivision to appear on each credit card and check related to its account. Additionally, these entities, including counties, must report any rewards accrued from credit cards annually to the Auditor of State. House Bill 312 also generally prohibits the use of debit card accounts by local governments except for law enforcement purposes. House Bill 312, which seeks to protect taxpayer dollars and encourage responsible spending, now awaits consideration by the Ohio Senate. Columbus - State Representatives Andy Thompson (R-Marietta) and Dave Greenspan (R-Westlake) today announced that the Ohio House passed House Concurrent Resolution 10, which condemns the Boycott, Divestment and Sanctions (BDS) movement and brings attention to incidents of anti-Semitism at college campuses in Ohio. House Concurrent Resolution 10 aims to reinforce the relationship Ohio has with Israel by strengthening ties and increasing collaboration with the country through business, government, the arts, culture and education. The resolution also works to raise awareness about recent events across the nation where anti-Semitic sentiments and the BDS movement have been promoted on college campuses. In an effort to protect students’ right to free speech, the resolution also urges university administrators to discipline any faculty, staff or students who violate free speech at colleges and universities in Ohio. “This resolution sends a strong message to our state and federal leaders that the General Assembly supports peace, justice, equality, democracy and human rights for all people in the Middle East and in the United States and that we condemn all attacks against the people of Israel and those who support Israel - regardless of their national origin, religion or beliefs,” said Rep. Greenspan. House Concurrent Resolution 10 now heads to the Senate for further consideration. COLUMBUS - State Representative Dave Greenspan (R-Westlake) today announced that the House Insurance Committee unanimously approved House Bill 336, legislation he joint sponsored with Rep. John Barnes (D-Cleveland) that addresses driver’s license reinstatement fees. The bill would require the Registrar of Motor Vehicles to establish a temporary six-month driver’s license reinstatement fee debt reduction and waiver program for individuals who had their licenses suspended for a variety of specified offenses. The program would set up certain eligibility requirements to receive a fee reduction or waiver, including the following: that at least 18 months have passed since the suspension was imposed, the offender is indigent, and the offense that led to the license suspension did not involve alcohol, drugs, or a deadly weapon. The Reinstatement Fee Amnesty Initiative seeks to help Ohioans who may not have the extra funds to pay the fee and are trying to get back on their feet. Many with suspended licenses continue to drive anyway, and the bill would incentivize individuals to legally reinstate their license and keep their insurance coverage. House Bill 336 now awaits consideration for a vote by the full House. 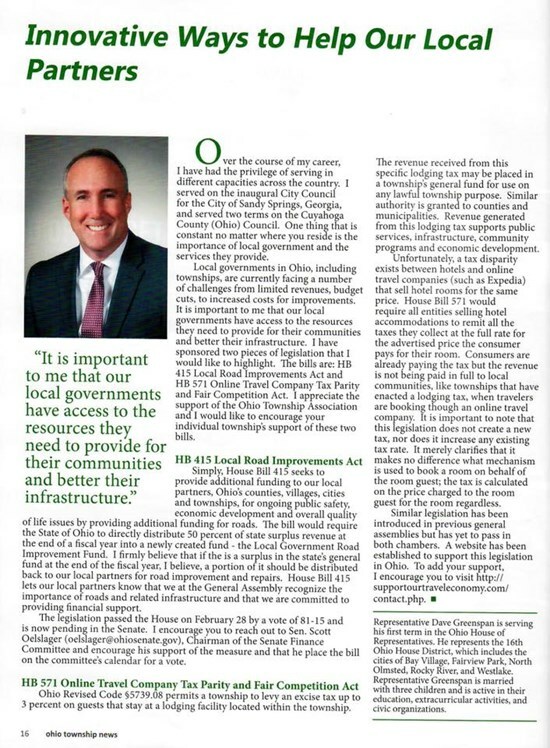 COLUMBUS - State Representatives Dave Greenspan (R-Westlake) and Scott Ryan (R-Newark) today introduced legislation that would give local governments greater control and financial discretion over road repairs. House Bill 415 would establish the Local Government Road Improvement Fund, which would be funded by 50 percent of state surplus revenue. Any revenue within the fund would be directly distributed to villages, cities, and townships to go towards road improvements. "Maintaining our infrastructure is one of our core fundamental responsibilities," said Rep. Greenspan. "This is a public safety, economic development, and overall quality of life issue for our local partners and this distribution formula of state surplus funds is equitable." The distribution of funds to counties would be based off the total number of miles of roadways maintained by a county divided by the total number of miles maintained by the state. The same holds true for roadways maintained by a political subdivision divided by the number maintained by a county. "I am pleased to join Rep. Greenspan in offering this legislation which will provide an increased incentive for state and local governments to work together to provide more efficient government," said Rep. Ryan. "This bill will assist in maintaining and improving local infrastructure that is vital to the economic success of all Ohioans." House Bill 415 now awaits a committee designation. COLUMBUS - The Ohio House yesterday voted in favor of House Bill 251, sponsored by Dave Greenspan (R-Westlake), which expands the current five-year limit on political subdivisions investment ability to a limit of 10 years. This increases the maturity of the investment, which increases the municipality’s revenue opportunity. House Bill 251 is a Buckeye Pathway bill that passed with bipartisan support and now awaits further consideration from the Ohio Senate. COLUMBUS - Recently, it seems our country has been impacted over and over again by natural disasters. Texas, Florida, and Puerto Rico are still reeling from the number of hurricanes that hit the Caribbean over the past several weeks. And now, California is waging a war against wildfires that have already racked up too many deaths. These events sparked the House’s passage of legislation that had already been in the works for months, the Disaster Relief Act. House Bill 133 will exempt out-of-state communications, utilities, infrastructure companies and other qualifying entities from certain taxes during a declared disaster. These tax exemptions include state and municipal income taxes, state and local sales taxes, the commercial activity tax, and occupational licensing requirements. This exemption will eliminate red tape, allowing businesses to deploy resources faster and more quickly make repairs should a disaster occur in Ohio. While our state is typically out of the impact range for hurricanes and wildfires, we are still susceptible to natural disasters like tornados, floods, and blizzards. In these circumstances, it is important that our communities get needed help as quickly and efficiently as possible. Ohio has done its part to help other regions of our country in their rebuilding process after these disasters. Our National Guard has been deployed to aid in rescue efforts and contractors statewide have left to return power to people’s homes and rebuild roads and buildings. I’m proud that Ohio has been able to help our fellow citizens, and should we be in a similar situation, the Disaster Relief Act will help other states do the same for us. 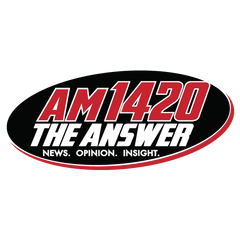 I want to thank Nick Phillips for the opportunity to discuss public policy tonight on his show "The Advocate" on WHK Radio 1420 am in Cleveland. Thank you Nick. Thank you to Jasen Sokol for having me on your show today to discuss House Bill 336 . It is always a privilege to speak to you and your listeners. 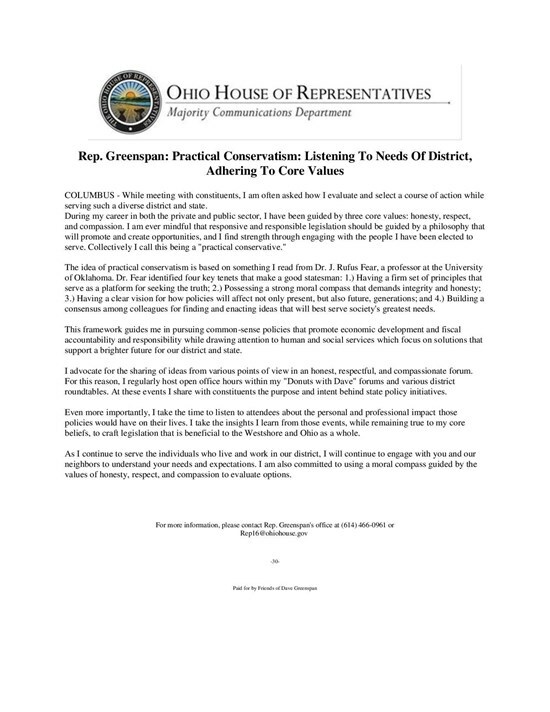 Columbus - State Representative Dave Greenspan (R-Westlake) today applauded the Ohio House’s passage of legislation granting certain veterans’ organizations an exemption from property taxes. House Bill 24, sponsored by Rep. Tim Ginter (R-Salem), expands a current tax exemption for property to qualifying 501(c)(4) veterans’ organizations that are exempt from federal income tax. Property that is not used for meetings, administrative needs, or to provide programs or services is excluded from this exemption. House Bill 24 now heads to the Ohio Senate for consideration. During my first year in the legislature, I have been closely monitoring the opioid epidemic that has been overtaking our state and country. It’s been a complex and comprehensive issue, one that has required cracking down on pill mills and prescription drug laws and increasing prevention efforts. We’ve made great strides in some areas, but a recent announcement by the Ohio Department of Health reveals that there is much more work to be done. In 2016, over 4,000 deaths of Ohioans were caused by unintentional drug overdoses, a statistic up 32.8 percent from 2015. Much of this increase was found to be due to the presence of stronger drugs, like fentanyl and carfentanil, demonstrating how the opioid crisis continues to evolve. Fentanyl and related drugs were involved in more than half of these drug overdose deaths, compared to 37.9 percent in 2015. Fentanyl can be hundreds of times stronger than heroin, and carfentanil is even stronger than that. These drugs are so often mixed with other substances, unknowingly to the user, resulting in tougher addictions and more overdoses. We have to help those who are struggling, putting an end to the addiction cycle and cutting off the demand for heroin and other drugs that keep dealers employed. Through the HOPES (Heroin, Opioids, Prevention, Education, and Safety) Agenda at the Ohio House, we’ve worked to establish preventative measures while funneling funds towards the organizations that are on the front lines of this epidemic. For those in the 16th House District and the rest of northeastern Ohio, the ADAMHS (Alcohol, Drug Addiction, and Mental Health Services) Board of Cuyahoga County is a great resource for the addicted and their loved ones. Its mission is to improve the well being of our community by eliminating substance abuse and addiction in Cuyahoga County and enhancing support for mental illness, which is so often associated with addiction. More information can be found at adamhscc.org or by calling (216) 241-3400. If you or someone you know is fighting addiction, I encourage you to reach out to the ADAMHS Board of Cuyahoga County or another resource for support. Only through asking and receiving help can we hope to end this crisis and return to a healthy Ohio. COLUMBUS—State Representative Dave Greenspan (R-Westlake) today announced that the United States Environmental Protection Agency (EPA) is now accepting applications for its 2017 School Bus Rebate Program. The EPA is offering up to $20,000 in grant money per vehicle to replace older school buses and up to $6,000 per vehicle for retrofits. New and retrofitted vehicles will help reduce harmful exhaust emission, improving the health of students and the community. School districts, municipalities, or private entities that operate school buses through a contract may apply with the application form available at www.epa.gov/cleandiesel/clean-diesel-rebates. The application period is open until November 14, 2017 at 4:00 p.m.
“This legislation encourages and promotes additional transparency and oversight for spending Ohioans’ tax dollars, while affirming a responsive and responsible form of governing,” said Rep. Greenspan. COLUMBUS - State Representative Dave Greenspan (R-Westlake) announced that the Ohio House has voted to override the Governor's veto of a provision in the state biennial budget bill related to the managed care organizations (MCOs) sales tax replacement plan. Under the budget bill, House Bill 49, Medicaid managed care organizations would be subject to a franchise fee, replacing a state and local sales tax on purchases made by Medicaid MCOs. In 2014, the state of Ohio was advised by the federal government that applying this sales tax was no longer permissible under federal law and that Ohio must comply by the end of June 2017. This franchise fee will be a replacement for the revenue local governments previously collected through the MCO sales tax. The House overrode the Governor's veto of this provision, including a measure that requires the Director of the Ohio Department of Medicaid to seek federal approval to raise the franchise fee, which has the potential to raise up to an additional $207 million each fiscal year. "This is an important message to send to our local partners, including Cuyahoga County and RTA, that we support their efforts to serve the residents and businesses of northeast Ohio," said Rep. Greenspan. The additional funds raised will be distributed to each county and transit authority that experiences reduced sales tax revenues due to the cessation of the sales tax on Medicaid MCOs, providing more aid to counties in their fight against the opioid epidemic. Representative Greenspan Announces Passage Of "Judy's Law"
Columbus - State Representative Dave Greenspan (R-Westlake) today announced that the Ohio House has passed House Bill 63, also known as “Judy’s Law,” which strengthens the penalties for perpetrators of felonious assault if an accelerant is used in committing the offense. State Representative Jim Hughes (R-Upper Arlington) introduced the legislation after learning about a Gahanna mother, Judy Malinowski, who was doused in gasoline and set on fire in August 2015 by her estranged boyfriend. Over 600 days later, Malinowski has had more than 50 surgeries and is still fighting for her life. Due to current law, the judge was only able to impose an 11-year sentence on her abuser. House Bill 63 would allow judges to add an additional prison term of six years for felonious assault if the offender used an accelerant in committing the offense and the abuse resulted in a permanent disfigurement or permanent substantial incapacity. Despite her horrific condition, Malinowski has continued to speak out about domestic violence and has made every effort to warn other victims. She also bravely recorded video testimony encouraging legislators to pass House Bill 63. NBC4 this week announced that Malinowski has been moved to a palliative care center and is no longer receiving medical care, but is resting comfortably. Malinowski’s family remains optimistic. Judy’s Law passed unanimously with bipartisan support and now goes to the Ohio Senate for further consideration. 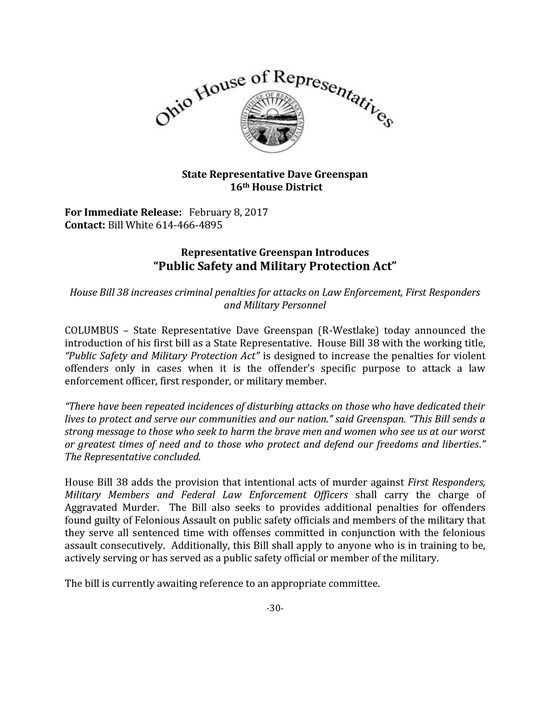 COLUMBUS - State Representative Dave Greenspan (R-Westlake) today announced that the Ohio House of Representatives has passed legislation that would increase penalties against an offender who feloniously assaults or murders a first responder or member of the military with targeted intent. House Bill 38, sponsored by Rep. Greenspan, expands the offense of aggravated murder to include purposely causing the death of a first responder or military member when the offender had specific intent to commit the crime against one of these individuals. Under the legislation, a first responder is defined as a firefighter or emergency medical service provider. Additionally, the definition of a military member includes a member of the United States Armed Forces, reserves, the Ohio National Guard, or a participant in ROTC. Also known as the “Public Safety and Military Protection Act,” House Bill 38 comes in response to a recent upsurge in specifically directed attacks on police officers and other officials, including the murders of a Danville police officer and a Kirkersville Police Chief in Ohio. Passed during National Police Week, the bill retains current law with regard to enhanced protections related to law enforcement and peace officers, but expands those definitions to include those who previously served in such a capacity. House Bill 38, a part of the Buckeye Pathway policy platform, now awaits further consideration in the Ohio Senate. COLUMBUS-The Ohio House of Representatives this week passed House Bill 49, the state operating budget. The bill addresses some of Ohio's most pressing issues, including more than $170 million in funding towards combating Ohio's opioid epidemic and providing additional resources to schools. Representative Dave Greenspan (R-Westlake) voted in support of the legislation. In response to lower than expected revenue estimates, the House restrained spending and facilitated sound fiscal policies by staying under the rate of inflation for the first time in several years and spending about $2.5 billion less than the executive proposal over the biennium. Enhancing opportunities for all Ohioans is a central component of the state operating budget through additional school funding, ensuring that students have the resources to learn and grow. House Bill 49 increases funding compared to the executive budget proposal by more than $90 million over the biennium. Through a series of provisions, the budget strengthens accountability in the state's Medicaid program by placing guardrails on future Medicaid Group VIII spending through the Controlling Board. The bill also returns Medicaid oversight to the General Assembly by directing the Department of Medicaid to seek a federal waiver to require a Group VIII Medicaid recipient to be one of the following: over 55, medically fragile, employed, in an education or workforce training program, or in a recovery program. The House's budget bill, sponsored by House Finance Chairman Ryan Smith (R-Bidwell), will now go to the Ohio Senate for further consideration. 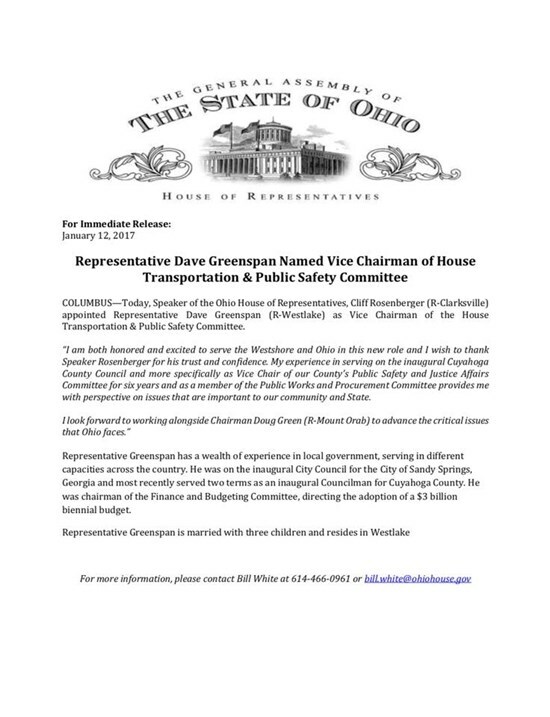 COLUMBUS— Speaker of the Ohio House Clifford A. Rosenberger (R-Clarksville) yesterday appointed State Representative Dave Greenspan (R-Westlake) to the Ohio Broadcast Educational Media Commission (BEMC). Rep. Greenspan will serve as a non-voting member on the 15-member board. The Ohio BEMC is an agency that works to advance education and accelerate learning for Ohioans through educational broadcasting services. In doing so, it promotes access to and use of educational television and radio and radio reading services. It also administers programs that provide financial and other assistance to these services. “I am honored to serve on the Commission and utilize my years of experience in television and radio with Turner Broadcasting, Atlanta Olympic Broadcasting, and the PGA TOUR Radio Network,” said Rep. Greenspan. Representative Greenspan’s appointment to the Ohio Broadcast Educational Media Commission took effect on April 17. COLUMBUS-State Representative Dave Greenspan (R-Westlake) yesterday announced that the Ohio House has passed legislation to help protect Ohio's seniors and other unsuspecting populations against deceptive marketing practices. House Bill 52 makes several reforms to regulate the solicitation of real property deeds. House Bill 52, sponsored by Rep. Jeff Rezabek (R-Clayton), comes in response to deed solicitation scams plaguing many Ohioans, whereby companies outside of Ohio will send official looking notifications to homeowners informing them that they need a copy of their property deed. Further, the notices will request up to $90 for the deed, preying on individuals who are unaware that they can receive a copy of their deed from the county recorder's office for a minimal fee. "I support this common-sense bill for its added protections to consumers, but particularly our seniors," said Greenspan. "As elected trustees, it is important for us to provide citizens with the tools to combat financial fraud and abuse." The provisions under the legislation require that specific disclosures be made to consumers when they are solicited a fee for real property deeds, including the cost to obtain the deed from the county recorder, the contact information for the county recorder, and the name and address of the person soliciting the fee. Other reforms prohibit the charging of a fee more than four times the cost to obtain a copy of a deed from the county recorder. A violation of these requirements falls under the Ohio Consumer Sales Practices Act and may result in a fine. House Bill 52 is a part of the Buckeye Pathway, the policy platform of the Ohio House Republican Caucus, as it seeks to protect our vulnerable populations and strengthen families and communities. The bill now awaits consideration in the Ohio Senate. COLUMBUS- State Representative Dave Greenspan (R-Westlake) today released a calendar of events in the 16th Ohio House District. These events include District Roundtable Discussions and Donuts with Dave. District Roundtable Discussions are intended to bring Columbus to the district. In so doing, Rep. Greenspan intends to invite the chairs of various House committees and subject matter experts to the district to discuss the legislative process and bills that have either passed through or are pending in a particular House committee. Additionally, this format will provide Columbus with an opportunity to share with the residents of the district the purpose and intent of public policy and to have an active grassroots dialogue of the issues facing the residents of the district. Donuts with Dave is a less formal opportunity for constituents to meet one-on-one with Rep. Greenspan to discuss issues that are important to them while sharing a cup of coffee and a doughnut. Monday, March 20th from 10:00 a.m. to 12:00 p.m.
Monday, April 3rd from 10:00 a.m. to 12:00 p.m.
Monday, April 10th from 10:00 a.m. to 12:00 p.m.
Saturday, April 29th 10:00 a.m. to 12:30 p.m.
All constituents are welcome to attend any or all of these events. If you are unable to join these events but would like to meet with Rep. Greenspan, please contact his office by phone at (614) 466-0961 or by email at Rep16@ohiohouse.gov to schedule a meeting in the district or in Columbus. COLUMBUS-State Representative Dave Greenspan (R-Westlake) yesterday applauded the Ohio House's passage of legislation that permits organizations to operate summer food programs Ohio's schools. House Bill 80 was joint sponsored by Representatives Sarah LaTourette (R-Chesterland) and Kent Smith (D-Euclid), both of whom represent important areas in Northeast Ohio. House Bill 80 allows school districts that opt out of providing summer food services to allow a summer food service program sponsor to utilize its facilities, with the approval of their local district board. The bill will increase access to meals for students who depend on free breakfast or lunch during the school year. Unfortunately, many school districts in this state are forced to opt out of this service due to local financial restraints. Under this bill, school districts would be able to charge a reasonable fee for the use of the school's facilities and related services. The food service program providers would be required to have insurance and be pre-approved. One out of four children in Ohio experience food insecurity and if this bill helps provide relief to those children, then this further demonstrates responsive and responsible government," said Representative Greenspan. House Bill 80 now awaits further consideration by the Ohio Senate. COLUMBUS-Representative Dave Greenspan (R-Westlake) today announced his committee assignments for the 132nd General Assembly. "Each one of these committees will have the task of guiding policy and legislation through the Ohio House," Speaker Rosenberger said. "Through the standing committee process, members on both sides of the aisle are charged with utilizing their knowledge and expertise to address issues important to Ohio's constituents, and their work is vital to moving our state forward in a positive direction." This committee receive all legislation for Ohio's transportation infrastructure, and community safety. This committee is designed to tackle the issues facing Ohio's economic future, employee- management relations, and business development. The committee of Government Accountability, and Oversight will properly review a wide variety of legislation that is critical to the citizens of Ohio. This committee will face issues of drug addiction, poverty, and community redevelopment. "I'm honored to serve the residents of the 16th House District and the State of Ohio on these very important committees." Representative Greenspan said. He continued by stating, "I'm looking forward to serving as Vice Chair of the Transportation and Public Safety Committee. This committee will address some of the most basic and fundamental community based quality of life issues facing our neighborhoods." Path to General Assembly: Defeated Democrat Tommy Greene in 2016's closest race for the Ohio Legislature, replacing the term-limited Nan Baker in House District 16. Rep. Dave Greenspan (R-Westlake) has arrived at the Ohio Statehouse after successive turns in more than a half dozen communities in the U.S., bringing with him a keen appreciation for local differences and concerns. Greenspan, who until recently served on the Cuyahoga County Council and chaired its Finance and Budgeting Committee, landed in Westlake a decade ago to reunite with his college sweetheart (now wife) and quickly became involved in local government after a previous council stint in Sandy Springs, GA.
"I'm fortunate I've been in elective office eight of the last 11 years," says Greenspan, who cites his work establishing police and fire departments in Sandy Springs and a fiscally stable $3 billion budget in Cuyahoga County as some of his more satisfying achievements. He has the distinction of serving on both governments' inaugural councils, with Cuyahoga County adopting a new charter in 2009 and Sandy Springs incorporating as a major municipality in 2005. Call that instant credibility. "It was one of the largest communities ever to incorporate in the U.S.," Greenspan says of Sandy Springs, which exceeded a population of 100,000 in 2014. He had spent his early days in New Jersey, completed junior high in south Florida, graduated from high school in Savanna, GA, completed a bachelor's degree in business and accounting at Troy University in Alabama, and began work at an accounting firm in Miami. Over the next 18 years, Greenspan rose to the position of senior production accountant with Turner Broadcasting System, Inc. in Atlanta; project manager with Atlanta Olympic Broadcasting 1996; chief operating officer with PGA Tour Radio Network (also in Atlanta); chief financial officer with software company MyTurn, Inc. in Jacksonville Beach, FL; CFO and executive vice president with online auction site ExchangeBLVD, Inc. (back in Atlanta); and ultimately to chief executive officer of his own consulting firm in Westlake, OH, Green Elk Consulting. It was his grandmother's work raising money for Israeli hospitals that ultimately led him to public service, he says. "Giving of your time is really what's of value. It's not something you can re-earn," she had told him. "Once you've spent it, you've spent it." Sandy Springs was an introduction to both state and local government, as Georgia's own Legislative Services Committee (LSC) and Joint Legislative Offices had drafted the city charter approved for local referendum by the Georgia General Assembly. Greenspan says Cuyahoga County has increased his knowledge of large-scale budgeting, as it boasts the largest municipal budget in the state. "It's the national model for how partisanly elected officials can operate in a non-partisan fashion," he says of the county's "outcomes-based" budgeting. "They choose to appoint chairmen based on skills rather than political affiliation." His tenure on county council ran concurrent with the Kasich administration and resulting cuts to the Local Government Fund (LGF). "It was somewhat of a challenging time to begin with. At the same time as the LGF cuts, you had income tax reductions and property tax reductions," he notes. "What has resulted from that is that our communities are working together more collaboratively to share services." Greenspan says his own district is beginning to recover in both property and income tax collections, factors the General Assembly will have to consider as it enters a tight budget cycle. "As legislators, we've got to identify what the priorities are for the state," he says. "Two priorities I think are essential are to ensure our local governments are operating effectively and efficiently and our local school systems are operating effectively and efficiently." He notes there are still more unemployed Ohioans than available jobs, even if employers cannot always find people with the qualifications and life skills to fill them. "If we don't get hold of this drug issue, it will undermine all the efforts we've made in the state to grow our economy. Otherwise, it doesn't make a difference if there are thousands of postings at the Ohio Means Jobs website. Businesses may take their jobs elsewhere," Greenspan says, describing an emerging trend in employment screening. "Some employers are saying to candidates, 'Show up on time and pass a drug test, and we'll train you.'" He says the state will have to get creative to solve the opioid problem. "There are only a finite amount of financial resources. We need to foster better collaborations with organizations that are handling the education and treatment of those individuals who are addicted." Among other legislative priorities, Greenspan says the state must continue to pursue an income tax structure that will "put more money in constituents' pockets than government's pockets." He wants to do more research on a sales tax expansion, however. "As a general rule, I 'm not in favor of broadening the base," he says, addressing one of Gov. John Kasich's recurring budget proposals. In the meantime, Greenspan is at work on the Public Safety and Military Protection Act, legislation that seeks to protect first responders and soldiers by increasing penalties for those who attack them. It is likely to draw support from a diverse group of lawmakers, though he says more contentious legislation does not mean people cannot be collegial and respectful. "I may not agree with all opinions, but I want people to feel comfortable that they can come to me. People should be treated fairly, whether it's a progressive opinion or a conservative opinion," says Greenspan. I wanted to take a moment and express my most sincere thanks and appreciation for the trust that you have placed in me this past Tuesday. I am humbled and honored to be your Representative Elect and am looking forward to taking office in January and being YOUR REPRESENTATIVE in Columbus. We ran an amazing campaign and I want to thank my family, friends, campaign staff and the dozens of volunteers that stood by me as we walked together toward our common goal. I also want to say a special thank you to my fellow colleagues and staff members of the Cuyahoga County Council. Since 2011, we came together and forged a bond of responsible and responsive government, and those values I will take with me to Columbus. We will continue to hold town hall meetings beginning in 2017, and our door will always be open to each and every one of you should you have questions, comments, opinions, or ideas. Together we will begin a new chapter to reclaim those days of innovation, growth, and prosperity here in Northeast Ohio and throughout the Buckeye State. Thank you again, and I am looking forward to representing you in Columbus. WE KNOCKED ON OUR 50,000th DOOR!!!! "I would like to express my sincere gratitude to our campaign staff, fellow elected officials and their staff & our dozens of volunteers for their tireless efforts and dedication. Your continued support is both energizing and humbling. This would not be possible without all of you. Thank you very much and I look forward to representing you in Columbus." Greenspan stated. Westlake, OH September 30, 2016 - Dave Greenspan, candidate for the Ohio House of Representatives, 16th District is pleased to announce that this past weekend we reached a milestone in the campaign, We knocked on our 40,000th door!!!! Westlake, OH September 13, 2016 - Dave Greenspan, candidate for the Ohio House of Representatives, 16th District is pleased to announce that his first campaign advertisement has been released. "I would like to express my sincere gratitude to my campaign staff and our dozens of volunteers that have made this possible. This is truly a team effort! I look forward to representing you in Columbus" Greenspan stated. Westlake, OH September 6, 2016 - Dave Greenspan, candidate for the Ohio House of Representatives, 16th District is pleased to announce that this past weekend we reached a milestone in the campaign, We knocked on our 30,000th door!!!! Westlake, OH June 9, 2016 - Dave Greenspan, candidate for the Ohio House of Representatives, 16th District has opened a campaign office. Campaign Director George Phillips stated, "We are pleased to announce that Team Greenpsan has opened a campaign office in the heart of the 16th District. This office will not only serve our staff and countless dedicated volunteers, but most importantly this will give the residents of the district a place and the opportunity to stop in, and talk with us regarding issues that are most important to them, their family and their community." Please contact George Phillips at 440.520.9828 or George@GreenspanForOhio.com for more information. Westlake, OH June 9, 2016 - Dave Greenspan, candidate for the Ohio House of Representatives, 16th District is pleased to announce the expansion of his campaign team for the upcoming general election. George Phillips will serve as Campaign Director and William "Bill" White will serve as Campaign Manager. "George and Bill bring a wealth of knowledge and expertise to the team. George's experience in the field as a former GOP Nominee for the Ohio House of Representatives and also as a consultant to various candidates and elected officials will greatly enhance our strategic planning for the campaign. Bill understands the inner workings of the Ohio House and has a proven track record of managing success campaigns for various representatives." Greenspan commented. Also joining the team are Campaign Coordinators Jonathan Jurisevic, Alex Corbett, and Anna Rostomyan. "Jonathan, Alex, and Anna are a welcome addition to the team. Each brings unique skills that will greatly enhance our campaign efforts." Greenspan added.